Inverting conventional approaches, Crary considers the problem of visuality not through the study of art works and images, but by analyzing the historical construction of the observer. 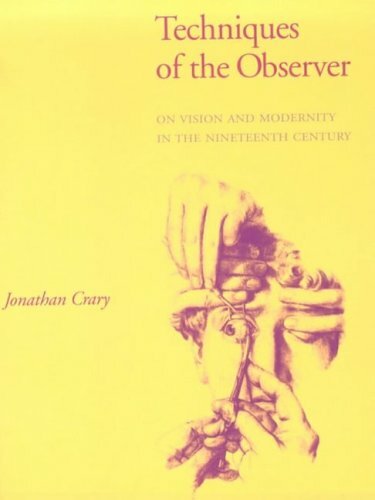 He insists that the problems of vision are inseparable from the operation of social power and examines how, beginning in the 1820s, the observer became the site of new discourses and practices that situated vision within the body as a physiological event. Alongside the sudden appearance of physiological optics, Crary points out, theories and models of “subjective vision” were developed that gave the observer a new autonomy and productivity while simultaneously allowing new forms of control and standardization of vision. Crary examines a range of diverse work in philosophy, in the empirical sciences, and in the elements of an emerging mass visual culture. He discusses at length the significance of optical apparatuses such as the stereoscope and of precinematic devices, detailing how they were the product of new physiological knowledge. He also shows how these forms of mass culture, usually labeled as “realist,” were in fact based on abstract models of vision, and he suggests that mimetic or perspectival notions of vision and representation were initially abandoned in the first half of the nineteenth century within a variety of powerful institutions and discourses, well before the modernist painting of the 1870s and 1880s.